The IRS is currently experiencing a shutdown and this is bound to have a big impact on taxpayers across the country. In this post we will be addressing the 3 major questions we have been getting from our tax clients about the upcoming tax season. 1) What Is the Government Shutdown and How Will It Affect You? 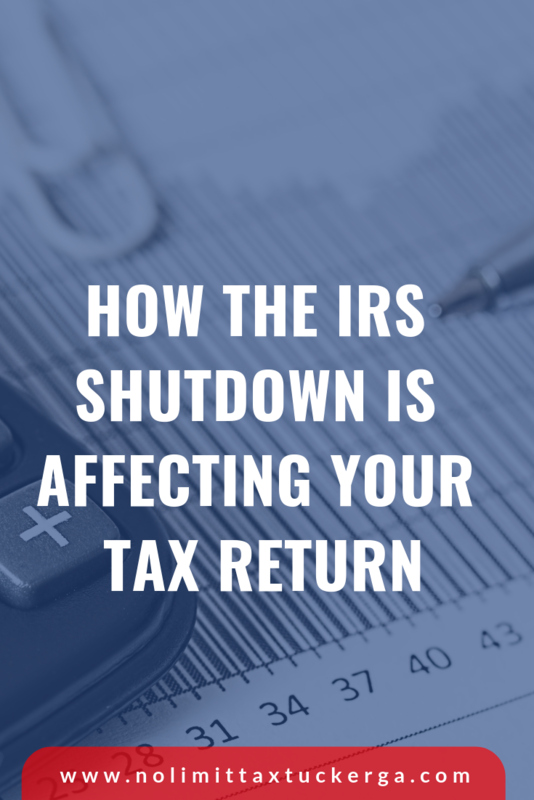 The IRS is currently experiencing a shutdown which will have a definite effect on the current tax season. Inevitably, certain processes will be delayed for the majority of individuals wishing to file for a tax refund. There might be a particular impact on those are looking to receive the EIC, Child Tax Credit or the American Opportunity Tax Credit. Overall though, it is expected that the IRS should be opening back up in the last days of January. There will be a delay from the time you file your taxes, to the time that you can actually receive your tax return. It is important to make sure that you have all of your correct forms, such as W-2 and healthcare forms, before attempting to file. It is also important to not that there are options to get credit-based loans or lines of credit based, and they are based on your current credit, not your expected tax return. These are ideal for individuals who don’t necessarily want to wait to receive their tax refund. They are able to get a loan immediately and usually are required to pay back the loan as soon as they receive their tax return/refund. 2) What Are Refund Advance Loans? Refund advance loans, unlike credit-based loans, go against your tax return/refund. They usually range from $500 – $6,000 and the amount received varies depending on personal information used to file your tax return. In order to qualify for a refund advance loan, you need your W-2 and your healthcare form. Essentially you need any necessary tax documents that would be used to file your tax refund. 3) Can I File Taxes With My Last Pay Stub? This a common question that people ask in regard to filing a tax return. The answer is no- you cannout file your tax return using your last pay stub. This is because the number on your last pay stub often doesn’t match the final number printed on your W-2. It is important that the number used to file your taxes is an exact match to what the IRS has, and this number will be what is displayed on your W-2. You want to make sure you use your W-2 as this can help you avoid any unneccesary delays with your tax refund.